Rent Infinity Event Center | Corporate Events | Wedding Locations, Event Spaces and Party Venues. Infinity Event Center is the newest state-of-the-art venue nestled in the heart of downtown Salt Lake City. We are within walking distance of shopping, restaurants, light rail, and hotels. 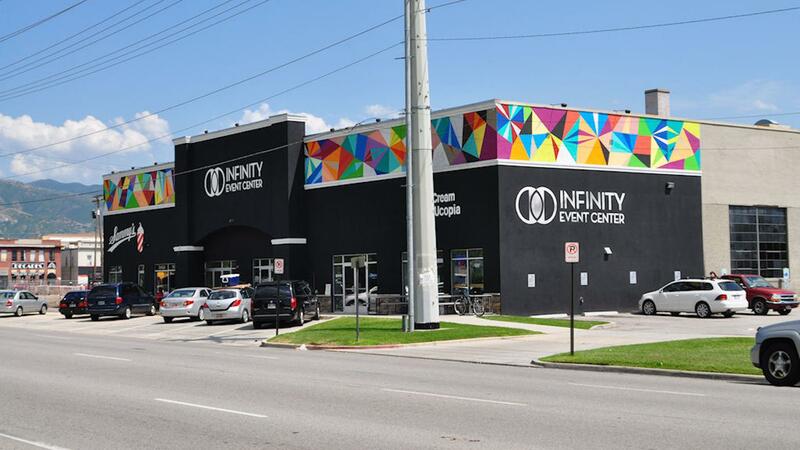 Nestled in the heart of downtown Salt Lake City, Utah Infinity Event Center is a premier event venue space, offering multiple rooms to rent for your public and private events. This event center provides amenities such as nearby parking lot, valet service, free wireless high-speed internet access in all rooms, non-smoking facility, etc. We can provide catering service through our preferred catering list, however we do allow outside catering as well. We provide lighting and audio visual services if needed. With one large ballroom, a bar, and lounge, Infinity Event Center can accommodate up to 1500 of your guests and is the ideal place to hold your next event. We will help you create an intimate private event, a large public concert, an elegant gala, a wedding or any other event.